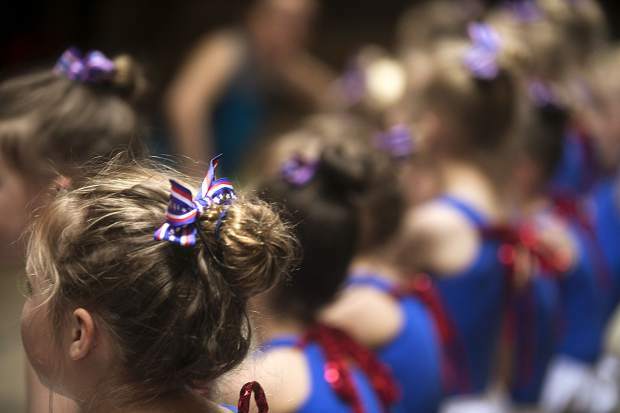 The Summit School of Dance has two recitals set for Sunday at the Riverwalk Center in Breckenridge. 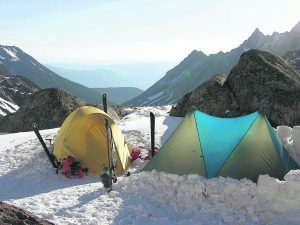 The first will be at 2 p.m. and the second begins at 5:30 p.m. The jazz 4 class from Alpine Dance Academy will be performing “Life Is a Highway” Saturday at the Riverwalk Center in Breckenridge. Dancers are Annika Kramer, Indy Tancheff, Carson Grace Earnest, Sarah Sandberg, Bethany McConnell, Shalynn Gray, Cecelia Miner, Avery Eytel, Saskia Martin Williams, Sophie Feller, Mary Gracy Crowe, Madeleine Trollinger, Pearl DeVito, Izzy Rowe, Lillianna Mathison and Harper Hagburg. The tap 5 class at Alpine Dance Academy will be performing “Do You Believe in Magic?” on Saturday at the Rivewalk Center in Brecknridge. The dancers are Leah Wilson, Brooke Kasprzyk, Jaye Muller, Kristina Fedynska, Rae Liebendorfer, Piper Smith, Gabby Braner, Lindsey McBride, Chanel Richmond and Lilly Ramsay. 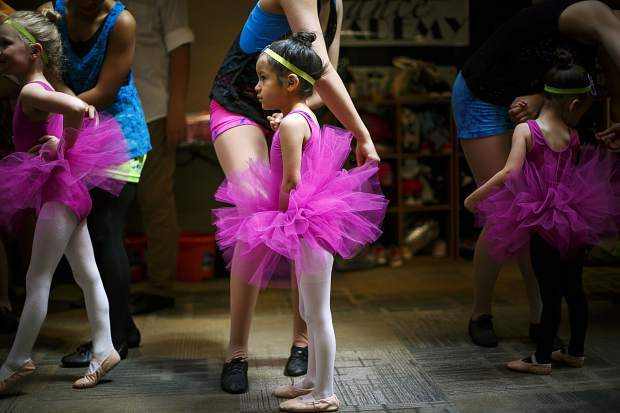 "Born In The New Millennium" three-year-old performers prepare to rehearse Saturday, May 12, inside the Alpine Dance Academy in Frisco for this Saturday's dance recital at the Riverwalk Center in Breckenridge. 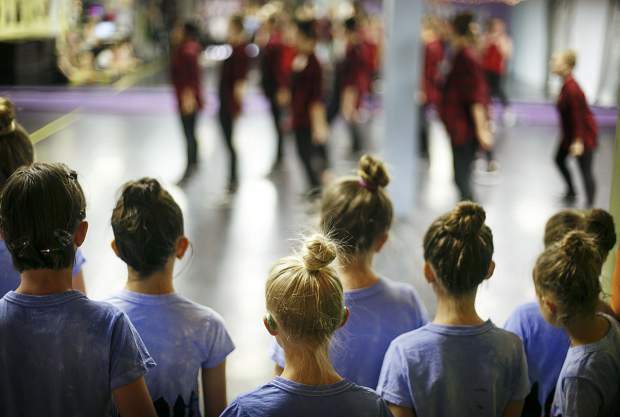 "Born In The New Millennium" performers watch others rehearse Saturday, May 12, inside the Alpine Dance Academy in Frisco for this Saturday's recital at the Riverwalk Center in Breckenridge. 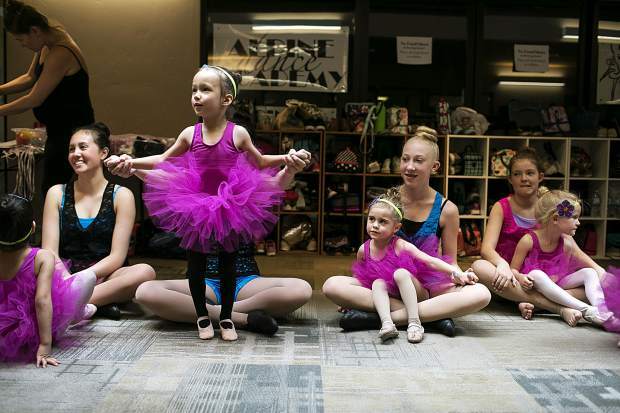 "Born In The New Millennium" performers rehearse Saturday, May 12, inside the Alpine Dance Academy in Frisco for this Saturday's recital at the Riverwalk Center in Breckenridge. 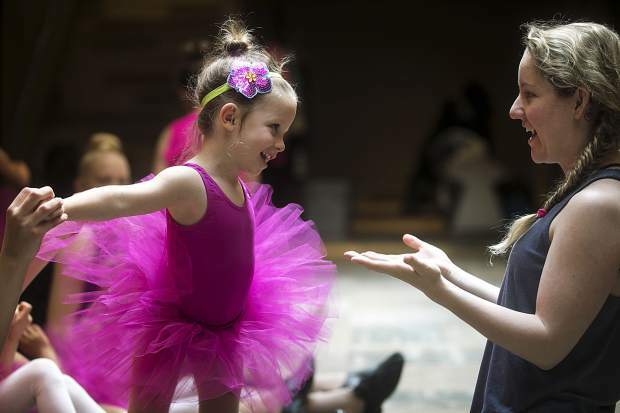 "Born In The New Millennium" 3-year-old performer interacts with an instructor during rehearsal Saturday, May 12, inside the Alpine Dance Academy in Frisco ahead of this Saturday's recital at the Riverwalk Center in Breckenridge. Bow-ties for a dance theme during rehearsal for the dance recital Saturday, May 12, at the dance studio in Frisco for this Saturday's recital at the Riverwalk Center in Breckenridge. "Born In The New Millennium" await to rehearse Saturday, May 12, inside the Alpine Dance Academy in Frisco for this Saturday's recital at the Riverwalk Center in Breckenridge. 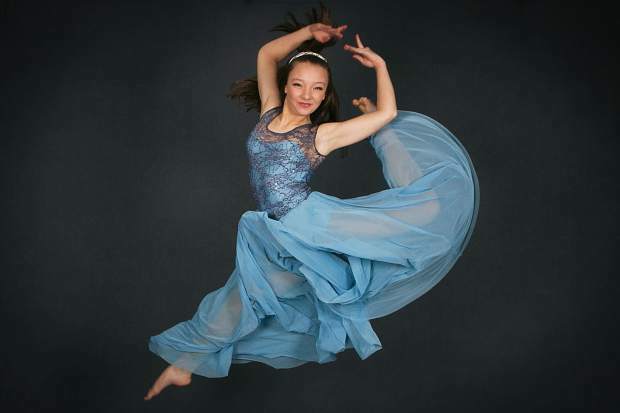 Two end-of-the-year dance recitals are this weekend, one from the Alpine Dance Academy and another by the Summit School of Dance, both at the Riverwalk Center in Breckenridge. Alpine Dance Academy goes first, and its students’ show begins at 6 p.m. Saturday with tickets selling for $15 for adults and $10 for kids. 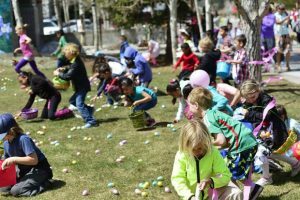 Children 4 and under get in free. Doors open at 4:30 p.m., and people are encouraged to arrive early to get good seats. The program this year, “Born In The New Millennium,” will be the studio’s first show featuring performers who were all born in the new millennium. 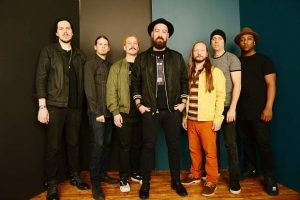 As such, the recital will tell a story of what it’s like to grow up in the new millennium with all of the music for the show coming from the year 2000 to today. It’s tied together by sentimental scenes about what it’s like to come of age in the era of Facebook, smartphones and Beyoncé, according to the dance studio. This year, Alpine Dance Academy has three graduating seniors in Meaghan Flannagan, Molly Caldwell and Sindell Perez-Fuentes. 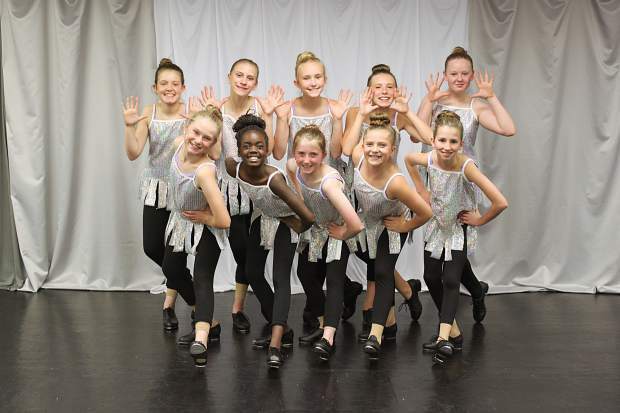 On Sunday, students from the Summit School of Dance will take the stage for two scheduled shows, one at 2 p.m. and another at 5:30 p.m., both Sunday at the Riverwalk Center. Doors open 15 minutes before each performance. 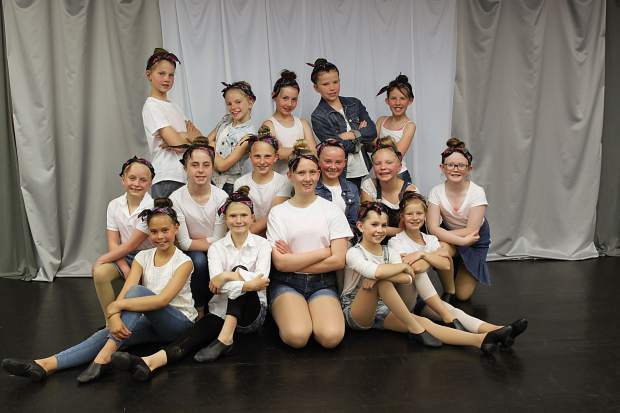 This recital, titled “Spring Into Dance,” comes with a little extra significance for the local dance studio, as it will be the first under new owner, Kelly Threlkeld, who took over after the previous owner, Melanie Frey, decided to take a step back from the business. 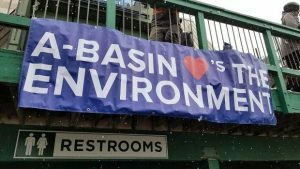 Tickets will be available at the door or can be purchased at BreckCreate.org/event/spring-into-dance/ for $18 for adults and $12 for children while kids 4 and under get in free.